Well the only way to get truth is the old fashioned way, do it yourself, or at least review a spreadsheet with sources cited. Anyone want to do a pier review on my work? Print it out, go have a beer on a pier, and let me know what you think. 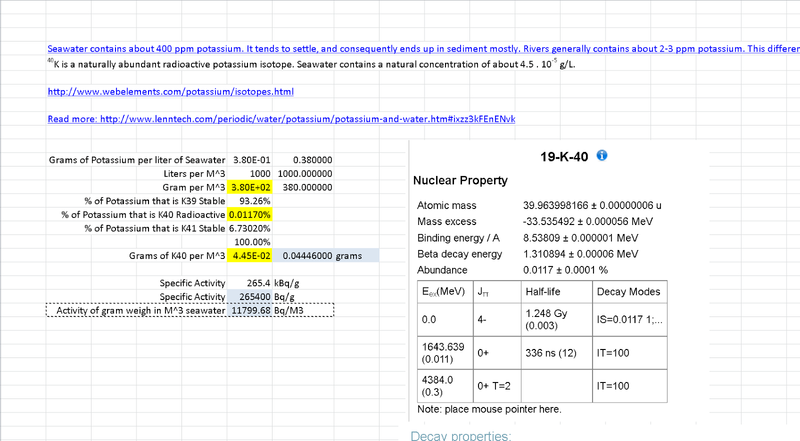 Also, if anyone has some knowledge, or time to kill, in terms of has the nuclear weapons program or nuclear energy increased the radioactive K40 in the biosphere, send me some links. The "activity" i.e. the release of radioactive blasts for Cesium, in California is now "only 8.4 Bq/M3" but it used to be just 1 to 1.5. So it has gone up 6 to 8 times what it was. Cesium bio-accumulates in the food chain, and is especially good at getting into the sea life and sticking around for longer than it does in land animals. So the radioactivity from Cesium is much less than from potassium, but potassium has been radiating away at sea life for 4 billion years. In fact potassium is an important element in every bit of life, plants and animals. And we have done fine with the levels we have. In the 1900's only 6% of humans ever got cancer, with those levels of potassium that exist AND DO NOT BIOACCUMULATE! So what has changed so that people are pitchforking the dead mammal off the beach? The domoic acid from algaes....confirmed cause of only 1 to 2% of deaths. Shooshhhhh!!!!!!!!!! Don't say Fukushima, I hear that is "only a conspiracy theory"
I was reading a study about the measurements after Chernobyl and they were in Kbq per km 3 terms. What is the most common way and if I wwre to compare those two measurements, what math should be done ? Also, when the measurement in the water is this much, is it probably the same in the air near the coast ?